As separatist forces creep closer to Mariupol, and Greece considers a further alliance with Russia, one group could put this new friendship on hold – Ukraine's Greek community. Following Greek Prime Minister Alexis Tsipras' visit to Moscow, there is fresh talk of a potential alliance between Russia and Greece against Europe. Alongside the two countries' religious affinity and shared anti-Western ideology, Greek commitments to host future Russian pipelines, and Russia's readiness to provide financial support (strengthening Athens' position ahead of negotiations with the IMF) have laid the emotional and economic foundations for this alliance. The roadmap outlining the extension of the Turkish Stream oil pipeline to Greece, signed on 21 April in Athens by Gazprom chief Aleksei Miller and Alexis Tsipras, is yet another plank in this alliance. Indeed, it looks like nothing can shake this newfound bond. But that is to reckon without Aleksandra Protsenko, 67, a retired secondary school headmaster from rural south-eastern Ukraine and president of the Greek community of Mariupol. An increasingly influential figure in Greek and Ukrainian politics, Protsenko's position regarding separatist aggression near the Azov coast, home to some 100,000 Ukrainian Greeks, could become a stumbling block to renewed Greek-Russian co-operation. With violence against Ukraine's Greeks featuring prominently in the Greek press as potential justification for closer ties with Russia, mission creep near Mariupol takes on fresh significance. Russia's policy in south-eastern Ukraine is far from a coherent expansion strategy. In fact, it has two different components. First, according to Moscow, the northern and central parts of Donetsk region will become another Transnistria. The self-proclaimed republics will allow Moscow to exhaust Kyiv and blackmail Europe. With military bases and training camps set up by Russian instructors around Donetsk, Russian military personnel commanding the local forces, and the growing concrete defence infrastructure, the region becomes a real stronghold of Russian influence in the east of Ukraine. With Russia's capture of Debaltsevo, supplies of soldiers, weapons, and armour have started coming from Russia by train, which makes Donetsk a bridgehead for any future offensive. In these conditions, Ukrainian troops will most likely have a tough time repelling future offensives or breaking the Republics’ defence lines. But while Russia seems likely to succeed in the north and centre of Donbas, it is not interested in developing a full-scale offensive. To support its narrative, Moscow needs the region to look like a republic proclaimed and organised on an entirely local basis. 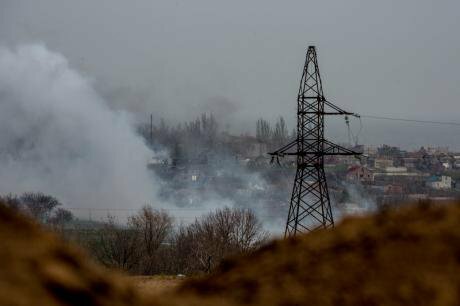 Ukraine's Azov battalion and separatist fighters have resumed fire in Shyrokine, near Mariupol. (c) Petr Shelmovskiy / Demotix. What happens south of Donetsk is a different story. The south of the region, including the Azov coast, has specific strategic value. It is the gateway for an overland corridor to Crimea, which Russia badly needs in order to secure supplies of electricity, water and food to the peninsula. This route would stretch through several Ukrainian regions, beyond the Donbas, and Russia would have to put in a lot of work to get through to Crimea. The port town of Mariupol is the key to this corridor. Unlike the operations in Donetsk and Luhansk, Russia tries to keep its offensive against Mariupol off the radar. Hence reports of attempts by Russian special forces and unmarked regular forces at swiftly capturing the town. Russian reconnaissance groups have also tried to penetrate the area several times. Although there have been some pro-Russian elements in the area, Moscow failed to take over the city and failed to secure an overland corridor to Crimea, meaning the peninsula remains heavily dependent on supplies of water, gas and electricity from mainland Ukraine. Right now, the new authorities are redirecting local rivers towards the south Crimean coast in order to secure a water supply for the Russian Black Sea Fleet in Sevastopol. This move will most likely result in the loss of arable land and, consequently, further shortage of water and food. Meanwhile, the prospect of the 'Kerch strait' bridge between mainland Russia and the Crimea being built, is still under discussion. As such, the task of capturing Mariupol remains an urgent task for Russia. Yet Mariupol looks an unattainable goal for Russia, for two reasons. First, Mariupol is an anomaly in the Donbas. Second, the Greek community of Mariupol. Capturing Mariupol remains an urgent task for Russia. Widely considered the preserve of criminal clans, the Donbas, with its population of marginalised low-skilled coal miners, has been fertile ground for pro-Russian propaganda and the populism of the now disbanded Party of Regions. Criminality and social degradation have taken their toll in this region. Mariupol is a different tale altogether. First off, Mariupol is not a coal mining town. The city hosts large metallurgy plants and other enterprises with a skilled working class and technical intelligentsia. With this demographic profile, the working ethics of the local population – their urban mythology – differs from the militant, self-centred culture of the rest of the Donbas. Secondly, unlike other parts of Donbas, Mariupol managed to avoid the traumatic experience of the 1990s – the collapse of state institutions and concomitant rise of criminal dictatorships. The metallurgy plants of Mariupol were effectively controlled by Vladimir Boiko. Born in the city, Boiko spent his entire life working in Mariupol, climbing the ladder from low-skilled worker to engineer and, eventually, director of the plant. A respectable 'red director' and later parliamentarian, Boiko was closely affiliated with centre-left and left parties (Socialist Party of Ukraine) rather than Viktor Yanukovych’s Party of Regions. Question marks hang over the legitimacy of the independence referendum in Mariupol last year. (c) Petr Shelmovskiy / Demotix. When Yanukovych came to power in 2010, Boiko was deprived of his shares and position and forced to sell the plant to the president’s closest associate Rinat Akhmetov. This aggressive takeover of Mariupol's main steelmaker by a highly controversial figure did not make the town more loyal to the Yanukovych regime. Thirdly, a brief period when the town was captured by pro-Russian militia prompted only disappointment on the part of Mariupol residents: the romanticism of the 'Russian world' (Russkii mir) was found lacking. When Ukrainian forces retook the city, local residents met them with relief. The local Greek community was instrumental in this. Although Greeks have lived on the Black Sea coast since ancient times, Mariupol acquired special meaning in the 18th century as part of Catherine the Great's project to reconquer Constantinople and introduce the Russian Empire as the successor to Byzantine glory. Russia used the newly conquered territories of the Azov and Black Sea coast to legitimise Catherine the Great’s 'Greek project'. Most of the settlements in the regions had Greek-related names – Mariupol (St Mary Town), Odessa (Odysseas), Simferopol (City of Interest), Sevastopol (City of Respect), Theodosia (Lord’s Gift) and so on. Russia even invited a number of Greek colonists to settle in this area, and a great number of Greeks have lived in Ukraine since. 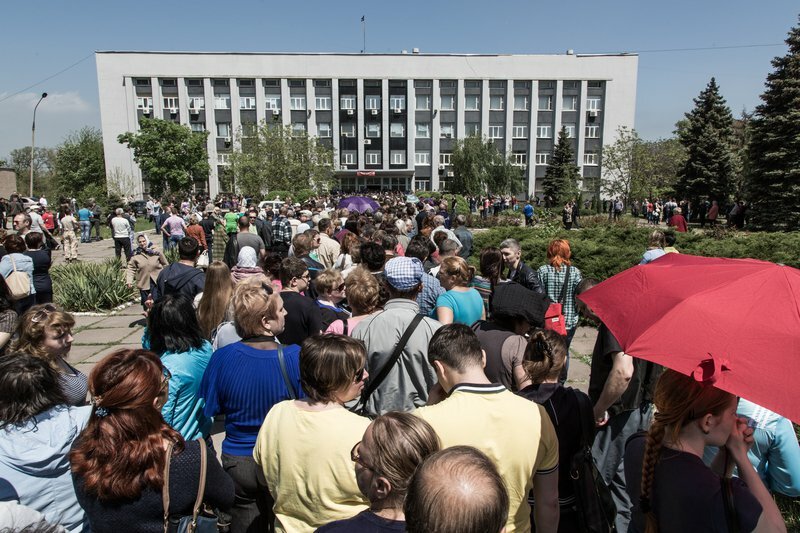 Today, the Greek community of Mariupol exceeds 100,000 people. Unlike similar communities in other post-Soviet countries, the Greeks of Mariupol were successfully integrated into Ukrainian society. Aleksandra Protsenko played a crucial role in this integration. Starting out as a school teacher and cultural activist in the early 1980s, Protsenko lobbied for more funding for the Greek-language schools in Mariupol and the area. In 1986, Protsenko was promoted and became director of a small town school just outside of Mariupol. In the pursuit of cultural and educational rights of Ukrainian Greeks, Protsenko has built up a strong reputation at home and abroad. Protsenko's name is often associated with the newly-established Mariupol State Institute of Humanities (MIH), where Greek is the main language of instruction. The MIH prepared a number of teachers for local Greek schools and became one of the symbols of the integration of the Greek community into Ukrainian society. Mariupol's Greek minority has attracted a lot of attention from the Greek state and media. A consulate was opened in Mariupol. The Institute for Humanities was supported by the Greek government. Summer schools and exchange visits became almost routine. Drawing on this success, Protsenko turned from a local minority rights activist into a national and international leader, becoming President of the Federation of Greek Communities in Ukraine and member of the Presidential National Minorities Commission. In the mid 1990s and early 2000s, Protsenko was one of the coordinators of the World Council of Hellenes Abroad and headed up the Greek Foreign Ministry's Secretariat for Greek Diaspora. With a certain authority acquired in Greek politics, Protsenko is popular among the Greek diaspora from America to Australia, and this is important in Greece – a country particularly sensitive to its compatriots abroad. All of this has made the Greeks of Mariupol more than just a cultural community in a remote Ukrainian area. Mariupol's Greeks have become a significant factor in national politics and an important factor in bilateral relations. Ironic it may be, but this community, largely a creation of Russian imperial design from the 18th century, has come to impede Russian narratives about south-eastern Ukraine. With the Russian annexation of Crimea, Alexandra Protsenko has repeatedly stated that Ukrainian Greeks consider Ukraine their homeland: they do not want Russia's protection. Protsenko has directly challenged statements by Syriza about repressions against ethnic minorities in Ukraine committed by the Ukrainian state. Likewise, Protsenko has repeatedly stated that, during the brief period when Mariupol was controlled by self-proclaimed republics in 2014, separatists relied on local criminal elements. Protsenko's rich local knowledge, together with her position as teacher, has helped her to frame the developments in Mariupol in a narrative of 'normal people vs. hooligans and bandits', successfully challenging Russia's narrative of the crisis in Ukraine as an inter-ethnic or centre-periphery conflict. Crosses in front of the Russian Embassy, Kyiv. 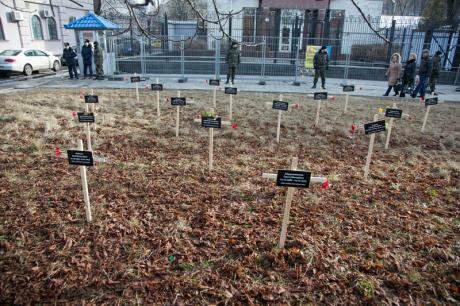 They bear the names of those killed in the shelling of Mariupol in January. After several civilians of Greek extraction were killed during the shelling of Mariupol suburbs in October 2014, the symbolic meaning of the city increased tenfold. Several public appeals by Ukrainian Greeks to the Greek government to save them from the horrors of war has only bolstered the importance of Mariupol in Greek public debate. And although it is not stated explicitly, Russia is blamed for the sufferings of Greeks. For Greek society and its multi-million diaspora, the developments in Mariupol have struck a painful chord. Greece has experienced a number of tragedies over the past century – repressions by the Ottoman Empire, occupation during the Second World War, mass migration in the 20th century and waves of refugees and repatriates coming to Greece during the collapse of the Soviet Union. The symbolic meaning of Mariupol has increased tenfold. Today, Aleksandra Protsenko divides her time delivering food to Ukrainian armed forces around Mariupol, attending hospitals to treat fighters of the volunteer battalions, and organising cultural activities for local Greek communities. And while Alexandra Ivanovna hands out food parcels, Mariupol's Greek community imposes significant limitations on Alexis Tsipras' overtures to President Putin. Tsipras has to face a permanent threat to his public image – by forgetting about Greeks who were killed during the shelling in Mariupol. Despite some signs of rapprochement between Russia and Greece, these limitations emerged prior and even during Tsipras' visit to Moscow. And earlier this year, there were suggestions to the effect that, in the case of further Russian aggression against Mariupol, Greece would support further sanctions against Russia. Although the Russian and Greek leaders spoke about various common interests in public during the visit, the Greek prime minister refused to meet representatives of Crimea's Greek communities. The Greek consulate in Russia, like other EU consulates, does not issue visas to Greeks of Crimea, recognising it as part of Ukraine. Even Tuesday's roadmap does not guarantee a strong energy link between the two countries. Once upon a time, Athens and Moscow dreamt up a joint oil pipeline project bringing Russian oil from the Bulgarian port of Burgas to the Alexandroupolis terminal in northern Greece. This dream lingered for a decade, between 1993 and 2003, until it was eventually abandoned due to negotiating fatigue and aggressive competitors. Greece and Russia may have made strong commitments to Turkish Stream, but doubts remain over the response of the European Commission and Energy Community, which forbids producers from possessing stakes in major transit infrastructure projects. Though Russia might be prepared to provide financial incentives in exchange for Greek support within the EU, it still looks like Athens cannot give what Moscow wants – a veto on sanctions in case of further expansion in south-eastern Ukraine. And if Russia launches an offensive in the area and captures Mariupol, Athens will find it difficult to give even rhetorical support. Image three: (c) Irina Sokolovksa / Demotix.